Do you want to be famous? Many people would answer that question without hesitation—yes! But God does some of His most significant work through His forgotten few. In this series, Chuck Swindoll reveals the crucial roles played by a number of lesser-known Old Testament characters. From Achan to Uzziah and through incredible victories and destructive defeats, God’s sovereignty shines through these lives. 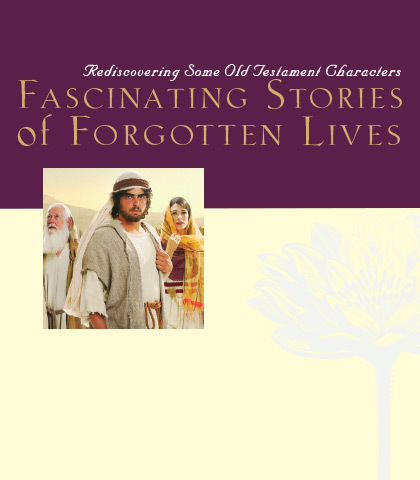 Fascinating Stories of Forgotten Lives reminds us that God loves to use unknown men and women—like you and me—to make His glory known! Somewhere back in time, you and I were given a faulty set of instructions. Somewhere we learned that only the most famous or the star athlete or the most publicly gifted individual is worth our time and attention, our respect and our loudest applause. But in reality, if it wasn’t for the people who surround them, these well-known individuals would quickly fade in popularity and become among the most commonplace. The story of Cain and Abel is tossed around rather generally in both Christian and non-Christian circles. Many folks are aware of the big picture aspect of the account—namely, that the older brother murdered the younger—but beyond that, little is known and even less is applied to everyday life. But woven within and between the lines of this amazing story are several insights that await our discovery. Letting go is always difficult. And the closer we are to the thing (or person) being released, the more difficult it is to let go. We must hold everything loosely. Some of the most poignant examples of letting go come in the context of parent-child relationships. Upon receiving God’s command to offer his son as a sacrifice, Abraham let Isaac go and obeyed without resistance, illustrating his allegiance to God above all. Two things make Achan’s story especially sad. First, it occurred so suddenly on the heels of an incredible victory—the miraculous invasion of Jericho. And second, it resulted in a devastating toll on so many others. One man—a single, isolated individual—deliberately chose to disobey, yet numerous innocent victims fell in the wake of his sin, bringing calamity to a nation. The story we discover recorded in 1 Samuel 25 is amazing—change a few particulars, the geography, and the date, and we find ourselves reenacting a series of events as modern as today’s news. It is the story of an unfair boss, a strained marriage, and a great-hearted woman whose act of unselfish bravery saved her husband’s neck! Its fairy tale ending makes the story one of the most memorable in all the Old Testament. Although a rather obscure character, Rehoboam, who lived in the days of the kings, illustrates the principle what appears on the surface doesn’t always match what lies beneath. We can learn many lessons about integrity from his life! Jabez emerges in the midst of epitaphs on tombstones as the Spirit of God is pleased to hover over his life a bit longer than any other mentioned in this context. Because God singles out Jabez, we are wise to pause and learn the truth of the story. By doing so, many who feel their lives are marked by obscurity and insignificance can gain fresh courage to excel. Though not strong in faith, Naaman was nevertheless greatly respected as a leader of troops and as a military warrior. One day all that was put on hold. None of his trophies seemed important any longer. He was unclean…he had become a leper. This is a story about a man, once proud and self-sufficient, finally humbling himself before the only One who could cleanse his leprosy…and did. Deep in the heart of Elisha’s helper, Gehazi, were smoldering embers of greed. Silently, secretively, they remained hidden. No one could tell by looking. Words never passed from Gehazi’s mouth, admitting such sin, but it was there nevertheless. Through a series of events those embers burst into full flame. As we recount the story, we want to take sufficient time to examine our own hearts and determine if we suffer from a similar malady.